Having a distinctive business card is vital in many situations, from meetings and negotiations to conferences and other networking events. Given the number of business cards your potential partners or new customers may receive, make sure that your own card will stand out from the pile. With this in mind, making business cards in-house may be a better idea than hiring a designer. Thanks to professional software such as Business Card Maker making business cards is fast, easy, and leaves a lot of space for creativity. Read on to learn five golden rules for making business cards that are sure to win! A maximum of three colors will create a harmonious layout. Do not use fancy fonts either - the information on a business card must be clear and easy to read. There must be clear contrast between the text color and the background. If you use a picture background, it's better to put the important data into white fields. 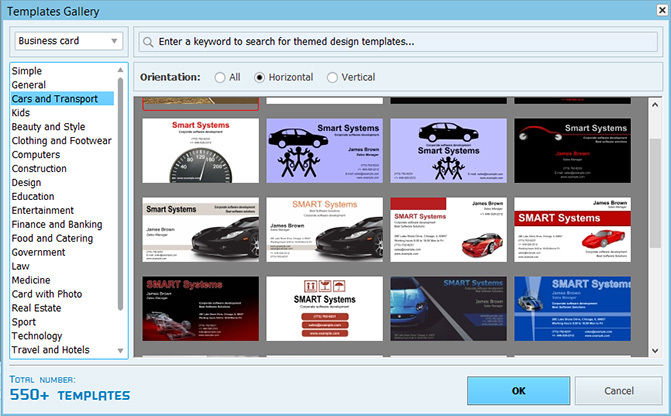 When you download Business Card Maker, you will see such templates in the program gallery. Your business card should be neat and professional, but there must be some detail that immediately says who you are and what you do, even before reading the text. It may be a stylish logo or a funky picture, depending on your business area. Remember that your logo or an image adds a nice touch only if it matches the overall composition. 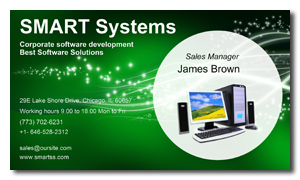 Making business cards for the company employees, make sure they reflect the corporate style. This may be achieved by using the same design template, the company colors, or logo. Sometimes it’s a good idea to add a photo to make a distinctive business card for each employee. If you are making business cards with photo, choose a photo of good quality and high resolution. Avoid making business cards with information on both sides. According to business etiquette, the reverse side must be left blank for making notes. For instance, you can write your additional contact details (like home phone or Skype number) for your new partner. 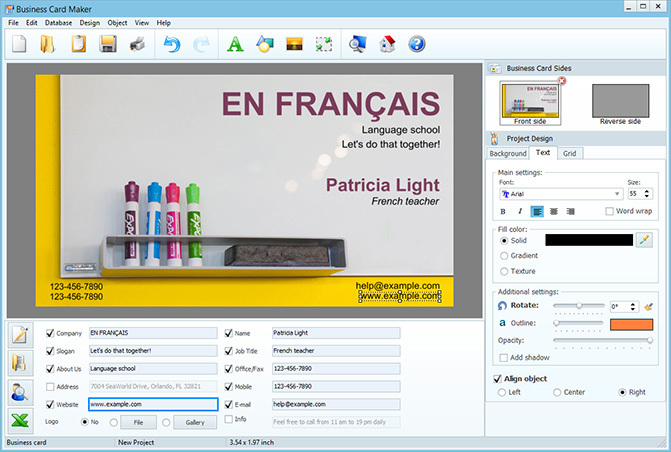 Some companies make double-sided business cards in two languages for international networking. This can be looked upon as lack of respect. You should prepare a special set of business cards for your foreign partners. Use high quality paper for printing business cards, so that even touching the card adds to the good impression. Avoid printing on glossy paper – though such business cards may look attractive, it will be difficult to write on the reverse side.